Mohammad Hanif Atmar, the former Afghan National Security Advisor, gave an interview to TOLOnews on Thursday, November 29. Reporterly has focused on the key points of the conversation. 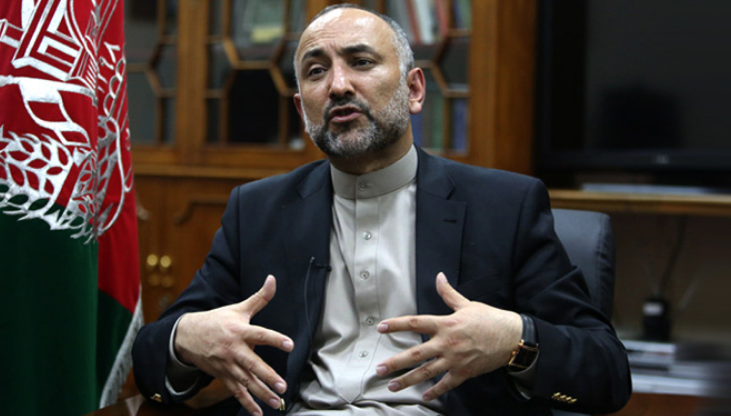 Hanif Atmar in the interview clarified that the mounting disagreements over policies as well as the president’s disregard for his consultations over the past year were the main reasons for his resignation. The former National Security Advisor in the conversation emphasised on the U.S.-Afghan Bilateral Security Agreement as one of the most important documents signed in the early days of the formation of the national unity government to strengthen the armed forces and independent defense of the country. In response to the recent escalation of insecurity in the country over the past few years, however, he said that there were more than 140,000 foreign troops in Afghanistan then, but now this responsibility solely lies with the Afghan armed forces who they do not have the equipment. One of the government’s major efforts under the four-year security plan was to equip and train the armed forces of the country, Mr. Atmar remarked. “Although we are by no means in a better security situation, the situation could have been worse than that. Thankfully, with the efforts and sacrifices of the Afghan armed forces, we did not let the situation deteriorate” he stated. In response to the political nature of security agencies, Mr. Atmar continues to claim that at the level of leadership, although the security bodies are somehow political, our security forces are apolitical whatsoever. He recalled attempts to depoliticise the security agencies, including appointments of security cadres. Mr. Atmar believes that the national unity of the country has been damaged in recent years. According to him, the government has failed to play its role not only in preserving the national unity, but also in strengthening and developing it. Mr Atmar cites the three major weaknesses of the government at various levels. First of all, the national unity government could not even establish a national unity between themselves and agree on major national issues, and dealt with subordinate issues such as appointments instead which led to a waste of time. Mr Atmar continues to count that the government also failed in ensuring national inclusion for all political groups in the country. “The government failed to create a real national inclusion in the system so that all political groups and cadres of the country feel that equal opportunity has been created for them and their participation has been provided by the government,” Mr. Atmar expressed. In response to the claims that foreign relations in the past few years have been fixated mainly on Iran and Russia, Mr. Atmar stated: “Our efforts were to expand relations at the regional level, and it was not only with Russia and Iran, but with the whole region. We started with India and received weapons and helicopters for our troops. We visited the whole region. We worked closely with China to support our troops”. He also noted the expansion of ties with Russia, Iran, Central Asia, and Arab countries, such as Saudi Arabia and Qatar. “The United States has taken a reasonable step to declare its commitment to Afghanistan peace,” said Mr. Atmar on the mission of the United States Special Representative for Afghanistan’s Peace, Zalmay Khalilzad. “The United States does not negotiate with the Taliban but talks to bring them to the negotiating table with the Afghan government is acceptable; we will support this action if this is the goal”. However, Mr Atmar stresses that there are also concerns about this. He believes that the ultimate goal of peace must be clarified to the people of Afghanistan. “Peace is acceptable under the Islamic Republic of Afghanistan, if peace leads to the establishment of the Islamic Emirate, it will not be acceptable to the people of Afghanistan,” he commented, “our red lines in the peace process are the constitution and the values ​​set forth in the constitution. There are three things that cannot be negotiated; first, Islamic system; second, human rights, civil rights, women’s rights and the rights of all Afghans, and the third is the nature of the system which is Islamic republic based on democracy”. Referring to the recent Moscow Peace Talks, he said that meetings without the presence, ownership and leadership of the Afghan government would not be effective at all. “If a group such as Fatimiyun ever operates out of the framework of our defense and security system and based on group interests and thoughts, it’s not only out of the country’s interest, but it’s illegal,” said Mr. Atmar, referring to the Fatimiyun controversy, “Citizens are required to serve and defend the country only under the Afghanistan flag,” he continuous to say, “We have raised our concerns with the Iranian government in this regard continuously, and the Iranian government has consistently assured us.” He emphasised that Iran is a friend of Afghanistan, and wherever the differences between the two countries exist, it can be solved based on the friendship we have. Mohammad Hanif Atmar, who was the former national security advisor to President Ghani, confirmed his candidacy for the upcoming presidential election, and insisted on the necessity of holding of elections, saying that the Afghan people would not accept any government without elections. He also said he does not want to be with Mr. Ghani in a team, but all Afghan leaders have to work together on major issues such as peace, security and elections. He stated in the conversation that he had advised President Ghani to give others the opportunity and to not contest as a candidate this time. According to Atmar, his talks with all political groups, including the Jamiat-e-Islami, are ongoing. He believes that any plans and recommendations of the Jamiat-e-Islami Party are worth considering. He also said he was in favour of amending the constitution for a third vice president so that all the people of Afghanistan would feel their presence in the leadership of the government.